Quick giveaway for this skirt that I picked and was sent to me from LOVE. Unfortunately it doesn't suit me, I asked if they wanted me to send it back but they said I could give it away instead. 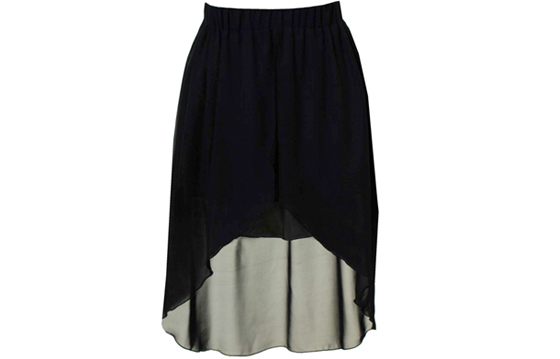 Its a black sheer skirt with a dipped back with open draped front panels. Its a really lovely skirt it just does nothing for me but Im sure someone else would appreciate it! - There will be ONE winner! - You must be a follower of this blog! - To enter all you need to do is comment below. - Leave your email or blog link so I can get in contact with you! I've been looking at them for awhile! It's gorgeous! Shame it doesn't suit you! Lily I love it!!! Would love to have the chance to nab it from you :) thanks! Please enter me its gorgeous! Ooh it looks lovely! I imagine it looking quite nonchalant! I really hope I win this, love it! Love that! Been looking for one like that for a while! Oo, that's pretty :) I'd like to enter please! Thats gorgeous! Ive been looking for something like this for ages! I would love to own that skirt, and it's in my size as well! Love this! Would love to be entered. Wow I have been after a skirt like that for ages! its so witchy and would suit my lookbook style so much!! and for the chance to be given it for free! well that is just so awesome! Its a shame it doesn't suit you lily :( it always seems to me that you can pull of anything! heres my blogger, www.charlietclothier.blogspot.com and my lookbook!! www.lookbook.nu/charliet thank you lily!! this is beautiful! it's a shame you couldn't have it! thats lovely, i'd like to enter. such a pretty colour! - enter me please. so pretty! i can imagine a few outfits with this! wow this is so lovely, fingers crossed !!! Hey, oh, this is such a lovely skirt! It looks beautiful. I'd love to win! I probly won't win anyway...but I'll try and join this. Had my eye on this skirt for a while, would love to win! this skirt is so pretty !!! This is such a lovely skirt! Ohhh it's gorgeous! If I don't win I will most definately be purchasing! i refuse to believe anything doesnt suit you! Such a nice skirt...I'd like to enter please! I would absolutely adore to be entered for this, thank you! Such a pretty skirt, lovely of you to be giving it away! It's lovely...hope this is open to international subcribers? Jumped on the sheer bandwagon a long time ago! And this one is beautiful. Just been looking for one of these skirts online, i LOVE it! Would love the chance to win this! Fingers crossed!! I've been looking at these for ages! wow that skirt is lovely! Lovely skirt, LOVE have a lot a of amazing clothes. Enter me please.. Love the skirt! eeii i am so into sheer black skirts at the moment, it seems perfect! Ooo I've been looking for a skirt just like this! This is lovely! Such a shame it doesn't suit you. Ooh it's a lovely skirt, count me in. Looks lovely, enter me please. oo i love the look of the skirt. That skirt is seriously cool!love this giveaway! Hot damn, I NEED that draped skirt! Beautiful skirt :) x great giveaway! this skirt is too cute!! Please enter me, it's so pretty! omg so in love with this! This skirt is so lovely. I've really been enjoying the extra posts on this blog. Love your work Lily! I would love that! Thanks for the giveaway! I LOVE these style skirts. I've been wanting for one for ages but can't afford one at the moment. Hopefully I'll be able to get one just before the summer ends!